Defender Aaron Phillips believes he is joining ‘a team on the up’ after signing for the Cobblers. The former Coventry City right-back has put pen to paper on a two-year deal at Sixfields, becoming new Town manager Rob Page’s first signing for the club. The 22-year-old has been brought in to provide competition for Brendan Moloney, and he can’t wait to get going. 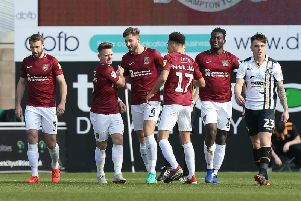 Phillips had first-hand experience of what the Cobblers were all about last season, starting for the Sky Blues in the FA Cup first round clash between the sides at the Ricoh Arena. And he was left with a good impression about the club both on and off the pitch as Northampton, cheered on by more than 2,000 fans, won 2-1. “I remember playing against a team that were very organised,” said Phillips. “They were well set up and they beat us. “Last year they’ve had a fantastic season, and to reach 99 points is some achievement, so I’m really looking forward to being at Northampton. “Their fans were very loud that day in the FA Cup – probably louder than the Coventry fans. They had a good following for that game and that’s one of the reasons why I wanted to come here. Phillips - whose dad Dave Phillips is a former Coventry player, and was part of their 1987 FA Cup winning team - has been with the Sky Blues since he was at primary school, and admits it is a big step for him to move away. “I’d been there since the age of seven, so it felt a bit crazy to leave, but that’s life,” said Phillips, who was released at the end of the season by manager Tony Mowbray. Cobblers boss Page is also a former Coventry player, and one that Phillips used to watch from the Ricoh Arena stands. Aside from a loan stint in non-League with Nuneaton Town, Leamington lad Phillips has played out his whole career in league one with Coventry, making more than 60 appearances at that level,. That experience was a key reason for Page bringing him to the club as the Town manager goes about strengthening a squad that stormed to the Sky Bet League Two title last season. So how does Phillips think the Cobblers will handle league one life as they step up a level? “I think if you’ve got the togetherness, and everything like that you will be okay, you just need to look at Burton, who were promoted twice in a row,” he said. “Why can’t Northampton do that? I’ve seen the way they play and it’s a good opportunity to push on and see if we can get into the promotion places, I think.